For those of you who didn't know that Russian military personnel have a great sense of humor, take a look at the names given to missiles, howitzers and air defense systems! The tradition of naming weapons on the basis of their external similarity to some other object dates back to the 16th century. It was then that grenades first appeared in the French army. The soldiers, not giving it much thought, gave the new weapon the name "pomegranate": The fruit has a similar shape, and the way grenades explode into small pieces is similar to pomegranate seeds. Russian engineers took a different route. The names of Russian weapons are clever, unusual and sometimes even cute. Perhaps all these names are just another way to tease the enemy's imagination. I'll pick some flowers and give you a "Bouquet"
There is a whole flower bed of weapons in the Russian army. The Giatsint ("hyacinth" in English) is a 152-mm self-propelled gun (it is informally called "genocide," a name that more accurately reflects its capabilities). There is the Tyulpan ("tulip"), which is a self-propelled mortar. 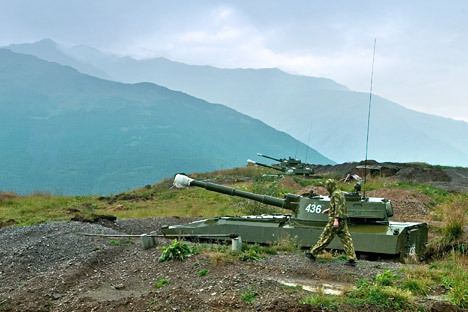 There is the Pion ("peony"), which is a self-propelled gun. There are also the 2C1 Gvozdika (“carnation”) and 2C3 Akatsiya (“acacia”) self-propelled howitzers, and the 2B9 Vasilek (“cornflower”) 82-mm mortar — and this isn't even the whole bouquet. By the way, the word "bouquet" is the name for a five-person convoy handcuff. In general, judging from the many names, military engineers are not adverse to sentimentality. The dull grayness of army life presses in on them, and engineers long for spiritual awakening and excitement. It must be because of this that we have the thermobaric warhead of the 9M216 Volneniye (“excitement”) missile, the Ulybka (“smile”) radiolocation system, the Ukrasheniye (“decoration”) 122-mm self-propelled missile with a cluster warhead, and the Laska (“tenderness” or “caress”) 240-mm self-propelled missile with a chemical warhead. Of course, we can't forget the Privet (“hello”) 23-mm rubber bullet or the Pozitiv (“positive”) radar station. Another source of inspiration in the defense industry has been the animal world. Here it would make sense to have some "tigers" and "leopards," but Russian engineers are honest people. The only tigers in Russia live in the Far East — but there are plenty of squirrels. That's why the Belka (“squirrel”) is the name of the M-14C 140-mm self-propelled shell, the RM-207A-U targeting missile, and the 4TUD military intelligence radio station. Additionally, there is the Kaban (“wild boar”) 96M6M ballistic training target, Kuznechik (“grasshopper”) MRK-2 mobile robotic unit, Mukha (“fly”) RPG-18 64-mm anti-tank grenade launcher, Yenot (“raccoon”) SET-65 533-mm self-guided torpedo, and Kanareika (“canary”) 6S1 silent automatic grenade launcher. The R-880M radio receiver is called Krevetka (“shrimp”). There is an automatic grenade launcher called the TKB-0134 Kozlik (“baby goat”). The 1L219 artillery intelligence radar vehicle with fire control has the short and comprehensive name of "Zoo." Overseas animals in good standing with the military are the Kolibri (“hummingbird”) 324-mm antisubmarine torpedo, and the Panda N001VP radar targeting system for modifying Su-27 aircraft. In fact, the Polufinal (“semifinal”) is the name of the 9E343 detonator. As long as we are on the topic, engineers named the RPO-2 manual flamethrower the Priz (“prize”). The military has its own take on the topic of health, as well. The Russian army has a radio station called the R-410M Diagnoz (“diagnosis”) and the BTR-80A Byinost (“turbulence”) armored personnel carrier. In addition, there is the 65S941 Tonus (“tone”) software technical unit and the BMM-1D Travmatizm (“injury”) medical vehicle. And then there is the quite depressing GP-25(30) Podkidysh (“abandoned baby”) 40-mm shot to an under-barrel grenade launcher. The subject of professions was also not neglected. It seems that many of those who think up names previously worked as journalists. This is alluded to with Gazetchik-E (“journalist”) radar station defense, the MKZ-10 Podzagolovok (“secondary headline”) electronic compatibility system, and the 9M27D Abzatz (“paragraph”) 220-mm self-propelled leaflet shell. Among professions, the military has honored the 15P159 Kuryer (“courier”) missile system, and even the Styuardessa (“stewardess”) radar system. Great Russian culture has also been taken into account. The 9A-4071 Balerinka (“ballerina”) is a 30-mm aviation cannon. The sports theme is touched on with the R-410 Atlet (“athlete”) radio station. Sometimes it seems that the names of Russian weapons sound happier than "Welcome!" — for example, the Molodets (“good job”) military railway missile system, the MRG-1 Ogonyok (“spark”) 55-mm shipboard 7-barreled grenade launcher, the Solntsepek (“blaze of the sun”) heavy flame-throwing system, and even the Vizit (“visit”) bulletproof vest. Add to that a few items of national identity — like the Buratino (popular Russian puppet character based on Pinocchio) 220-mm flame-throwing system and the Gzhel (traditional Russian ceramics) bulletproof vest — and you get a well-formed image of the Russian people. A romantic mood really seems to hover over the names of Russian armaments. There is the reckless uncertainty of the Variant (“option”) 40-mm grenade-launcher shovel and the playfulness of the Azart (“gusto”) shovel. We probably don't have to comment on the Nezhnost (“gentleness”) handcuffs, the Shalun (“mischief”) car, or the Ekstaz (“ecstasy”) flash grenade. To be fair, it should be noted that Russian weapons are not all "hummingbirds." The Russian army has in its arsenal the famous Grad (“hail”) rocket-propelled system, the 300-mm Smerch (“tornado”), and the S-300VM Antei-2500 (Antaeus from Greek mythology) anti-aircraft defense system. "Hurricanes" and "typhoons" in the history of world weaponry are a dime a dozen, but, when a TOS-1 Buratino (“Pinocchio”) 30-barrelled self-propelled flamethrower strikes terror into the hearts of hostile countries, that is something worth talking about.